The humble doughnut has undergone a makeover in recent months; it’s been transformed into a gourmet experience! The new doughnuts on the block come complete with decadent fillings and unusual toppings, and are often found in fancy coffee shops, at street food markets or at festivals. 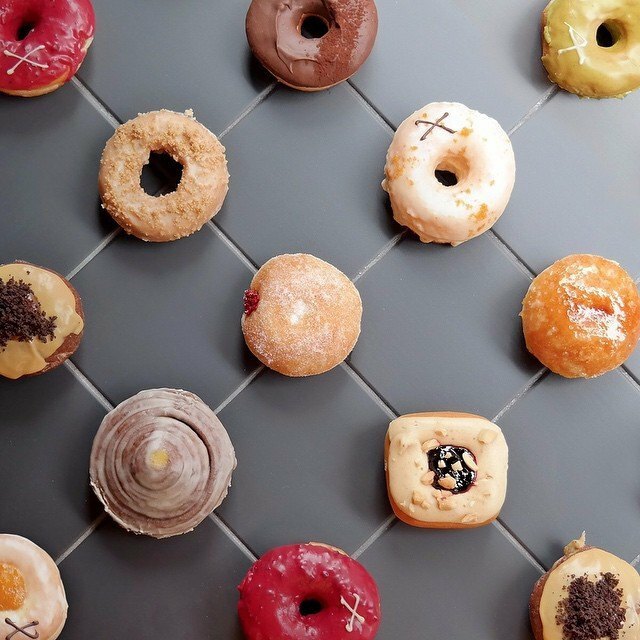 Our Executive Chef, Darren Deadman, has been hunting down the top posh doughnuts in London. Here are the top ten Darren recommends, all tried and tested. Glazed & Confused make incredible gourmet doughnuts. They’re handcrafted using traditional bakery methods, using only top quality ingredients. Flavours are a little more unusual that your standard jam doughnuts – Darren says be adventurous – go for the kiwi and white chocolate one! From £1.50. As well as delivering straight to your door, Glazed & Confused dougnuts can be found at a number of independent coffee shops in London. See the full list here. Crosstown doughnuts offer a dizzying array of flavours in the place of jam, from salted caramel to chocolate and chilli cream. Each doughnut is carefully styled with specialist glazings and toppings to look “colourful and playful”, according to founder JP Then. crème brulees doughnuts are a new discovery here at Create HQ – but a very popular one! £3.50, sold in Selfridges on London’s Oxford Street and independents stockists listed here. St John has reigned supreme in the doughnut world for many years, drawing a regular Saturday crowd of pilgrimaging doughnut addicts to its Maltby Street Arch. These are fancy doughnuts indeed, with a sourdough-enhanced texture and seasonal fillings such as rhubarb or apple compotes. £2.50, daily at the restaurant on St John Street, Saturday and Sundays at Maltby Street Arch. Bread Ahead serves up the most heavenly doughnuts at the foodie wonderland that is Borough Market. The dough is light as a feather, and the fillings abundant and rich. Darren’s favourite was the lemon curd, vanilla custard, rhubarb and a salted caramel creme finished with shards of freshly made honeycomb, closely followed by lavender and cardamom. £2.50, Borough Market on weekends. Famous KERB stall You Doughnut is the place to go for the cutest ‘nuts in town. Their doughnut bites are light as can be, fried in front of customers before being rolled in sugar and cinnamon. There are seasonal variations and tonnes of toppings to choose from – drowning your douhgnuts in salted caramel sauce is highly recommended. £2 for two bites, various KERB locations. Sky-high City restaurant Duck & Waffle has turned doughnut eating on its head, serving up savoury doughnuts that’ll blow your mind. The spicy ox cheek doughnut here is juicy and delicious, with crisp and fluffy dough. There’s jam too – it comes with a side of apricot jam, which complements the savoury ‘nut perfectly. Just around the corner from Oxford Street, this all-day brasserie serves up perfect cinnamon-dusted mini doughnut balls, with a pot of rich chocolate sauce for dipping. Forget the main meals – go straight for pudding. Bea Vo has turned the traditional doughnut on its head, replacing it with the equally brilliant ‘duffin’. A cross between a doughnut and a muffin, the baked treats are filled with raspberry jam, dipped in butter and coated in sugar. So good. Head to Whitechapel to try the frankenpastry that is the cro-dough – a croissaint doughnut hybrid so meltingly delicious you’ll forget all about its suspicious origins. A Mexican doughnut is a little different in shape to the Great British doughnuts, but it’s no less delicious. Churros Garcia is a three-generation family affair usually found on the Southbank or Portobello who put out a tempura-light batter, cover it in sugar, and dip it in chocolate. These straight, star shaped doughnut sticks are the best in London.